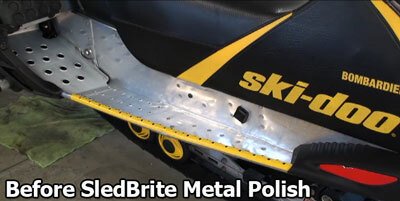 SledBrite Aluma Kleen is a biodegradable, non toxic snowmobile tunnel and aluminum cleaner that cleans and brightens aluminum and metal surfaces on your sled. Remove oxidation and discoloration from tunnels, aluminum and metal on snowmobile. Help prevent corrosion from returning. Clean, brighten and protect snowmobile tunnels in one step. SledBrite Aluma Kleen is excellent for removing oxidation, discoloration, salt and corrosion from snowmobile tunnels and aluminum components on your sled, trailer and vehicles. Fast acting formula foams on contact and rinses away clean. Contains corrosion inhibitors to help prevent rust and protect your sleds metals and aluminum. Excellent for removing salt corrosion in your snowmobile engine compartment. Sled Brite Metal Polish is guaranteed to shine your snowmobile tunnel, trailer, heat shields or virtually any oxidized metal. A few drops buffed onto a clean surface using a circular motion is all it takes. Your tunnel will shine like the day you picked it up from the show room floor. 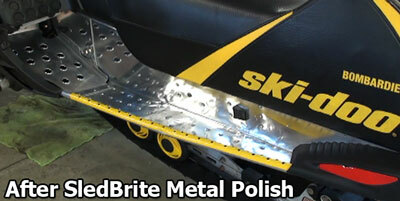 SledBrite Metal Polish is a concentrated, fast drying, metal polish formulated for hand cleaning of aluminum, stainless steel, gold, brass, chrome, silver and more. Now, for a limited time, get the SledBrite Aluma Kleen tunnel and aluminum cleaner and the SledBrite Metal Polish together in the Snowmobile Tunnel Restore Kit.